Bryce Pinkham is the Johnny Depp of musical theater. Give him a wildly eccentric/bizarre/screwed-up character, like the lovable serial killer in “A Gentleman’s Guide to Love & Murder,” and he is the best singing actor on Broadway. But like Depp in the movies, give him an ordinary romantic leading role, and he can underwhelm. Pinkham’s turn in “Holiday Inn” receded into the scenery. 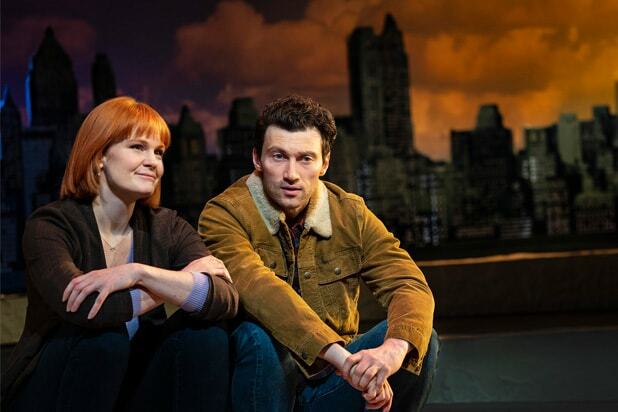 Fortunately, the casting gods are back in charge to bestow Pinkham with the very troubled/conflicted/angst-ridden title role in John Logan and Tom Kitt’s new musical, “Superhero,” which opened Thursday at Second Stage’s Tony Kiser Theater. Pinkham plays a guy named Jim who finds himself suddenly fired from his job driving a city bus, and, just as suddenly under siege by a love-struck widow, Charlotte (Kate Baldwin), and her teenage son, Simon (Kyle McArthur), who thinks the super-shy bus driver living in their apartment building is actually a very real superhero. All Simon needs to do is have his mother fall in love with Jim to find out the truth, because all superheroes have a girlfriend who knows the full truth. Think Lois Lane. Jim is the creation of book writer John Logan (“Red”) and composer Tom Kitt (“Next to Normal”), and Pinkham springs full-blown from a comic book to play him. His glowering presence and delayed timing make this unemployed bus driver alternately creepy and funny, off-putting and compelling, nerdy and appealing. In addition, Pinkham’s bright tenor is a throwback to another era in musical theater, when the high-pitched male voice was considered the ultimate in romance, before baritones took over most of the lead roles. Pinkham is on stage for so much of “Superhero” that we can ignore the far less interesting Charlotte and Simon and their endless mourning over a dead husband and father. Baldwin and McArthur are competent, but it’s unfortunate that the silent Jim can’t find more intriguing neighbors to share his secret. Baldwin is blessed with Kitt’s best number, “Laundry for Two.” The composer of “Next to Normal” and “If/Then” (which deserved better reviews from the critics) has a gift for melody, but his rhythmic palette needs variety. The second act could use an old-fashioned march or a tacky disco number to enliven the often lulling score. It’s understandable why Jim wants to ditch Charlotte and Simon as they wallow in their endless mourning, which is strictly Musical Theater Grief 101. Completely unexplored by Logan and Kitt is the voyeuristic pimping of a teenager wanting his mother to sleep with a man who may have special powers. Now that would have made Simon a compelling character. Logan’s book provides a few other characters who manage to give “Superhero” an after-school special glow. Jason Moore’s direction compensates by filling the stage with superheroes that jump from Simon’s notepad. Tal Yarden’s scrawling projection design makes it clear that Simon possesses a limited imagination: One superhero looks pretty much like another. Only Pinkham is in a class by himself.